I’m being a total cheater today. I knoooow that I just shared a super decadent and indulgent breakfast/breakfast for dinner recipe earlier this week, but I’m too excited about these cheater croissants to let them go one day longer. 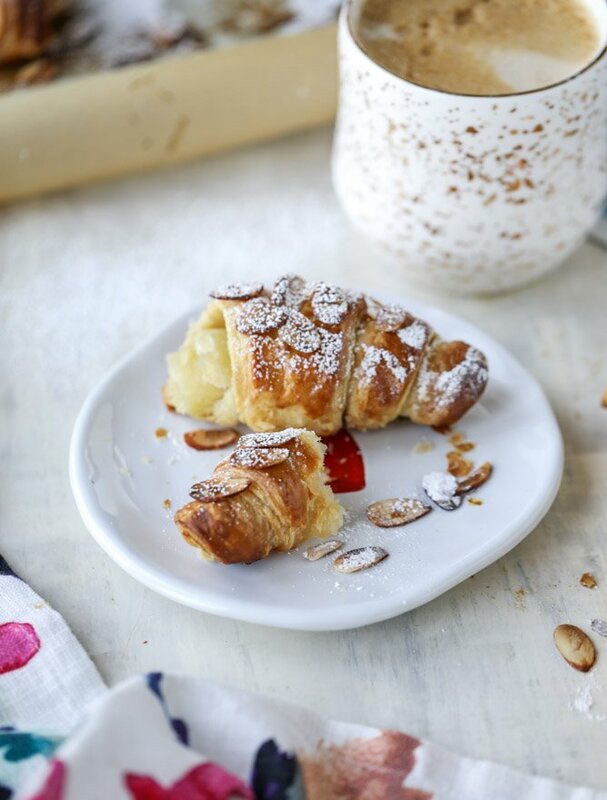 If you ever treat yourself to an almond croissant and a latte… well. Let me tell you. WE CAN MAKE THEM AT HOME IN UNDER AN HOUR! Sure, they aren’t huge and flakey with billions of layers, but they are still smaller and almost as flakey with a lot of layers. And a lot of flavor. Because we add extra butter. And coffee. On the side! Of course. I’m having (another?) major puff pastry moment. GOSH. Why is this stuff so good? Yes, I know that I can make it at home, but I don’t have the patience. So quickie, faux croissants with puff pastry? I’m down. That one time I made croissants – it was practically a two day process. And then I had to take all the croissants to my parents’ house because I could.not.stop.eating.them. Like, at all. Homemade croissants are a huge pain to make, but they taste so insanely phenomenal that you want to give up the rest of your life and open your own little croissant bakery. I mean it doesn’t sound like a terrible idea. The pain of waking up at 3AM daily would surely be dulled by flaky butter layers of love. Okay, so a few things! The key is to roll out the puff pastry pretty darn thin. And the triangles have to be rather small when you roll them, or else the center of the puff pastry won’t cook. And while you will have a flakey, golden croissant on the outside edges? When you bite into the inside, it will be a raw dough mess. Not so good. I learned the hard way. And! You might need to tent the croissants with foil after 20ish minutes of baking. They will probably get darker than you’d like if you don’t. But this is a small price to pay for croissants in an hour or less. Right? Guess what else we do with this? Brush them with ALMOND SYRUP. UGH. It is so delicious. I want to eat it with a spoon. If you don’t use it all up, you can save it for some sort of delicious amaretto-ish cocktails. This almond syrup might be my favorite part of this whole recipe. If you’re an almond freak like I am, you will die for this. The syrup holds the sliced almonds onto the croissants – it’s basically almond glue. In the most delicious way possible. You know how when you order an almond croissant, there is that delicious, almost sticky-like glaze on top of them? I’m guessing it’s some sort of syrup or glaze. We’re going with it. And finally, if you’re reeeeeally feeling it, you can fill these with some almond paste or almond pastry cream. Really, what else do we need in this world? Make sure the puff pastry is completely thawed! Take one sheet, cover it with the pieces of butter, and top it with the second sheet. Use a rolling pin to roll the pastry into a much larger, thinner rectangle – at least double the size if you can. Be patience and gentle with the pastry since it can easily tear! You need it to be as thin as possibly or inside will not cook. If this intimidates you, can you simply roll out 1 plain sheet of pastry, slice it into triangles, and roll it up. It won’t be quite as flakey, but it will still be delish! Once you have your large rectangle, use a pizza cutter or knife to cut triangles in the dough – like a “zig zag” pattern – from top to bottom. Take the bottom of each triangle and fold it up, rolling it up into a croissant-like shape. Place it on the baking sheet and repeat with the others. Brush the tops of the croissants with the beaten egg wash. Place them in the oven for 20 minutes. While the croissants are baking, heat the sugar and water over medium heat, stirring constantly until the sugar dissolves. Remove it from the heat, let it cool slightly, and stir in the almond extract. After 20 minutes, remove the croissants and brush them liberally with the almond syrup, then press the sliced almonds onto the dough. Sometimes I brushed before AND after the almonds were on. Return the croissants to the oven and bake for 5 to 10 minutes, until the tops start to get really golden and the almonds are toasting. Gently cover the croissants on the sheet with a piece of foil so they don’t burn and bake for 10 minutes more. You want to make sure the insides are done! You can even cut one open to see if you’d like. If it’s still doughy, return the sheet to the oven for 5 minutes increments (still covered in foil) until done. Let the croissants cool and then sprinkle them with powdered sugar and filling with almond paste or pastry cream if desired! OOH love the use of almond syrup! Fabulous croissants. Hand to God, I think I can smell them. Oh this is a dangerous recipe fore to know about. Almond croissants are the one thing that if I see I have to have it. Even if I have just eaten an absurdly big lunch if I spot an almond croissant I NEED it. I am so in love with this idea. Croissants are one of my guiltiest pleasures but making them at home always seems so daunting. LOVE this short cut. Will definitely be trying! The dirty water thing always cracked me up, too! The girl has a point! But I figured she’d come around, and I think tea is next! OMG so EASY! You’re 100 percent brilliant, and these look 100 percent perfect. Every time I got to a coffee shop I have to talk myself out of buying the almond croissants, knowing I can make them at home so easily might is dangerous! I need these in my life! Weekend project I think…? What is better than an almond croissant? Mmm, would add almond pastry creme to center and twice bake them. THESE are speaking to my soul. My favorite weekend treat is a stroll to a fancy pants patisserie around the block from our house for some pastry, but this way I don’t even have to leave the house! ;) win-win. As I was reading I was yelling (silently) “FILL IT WITH ALMOND PASTE” just like my beloved bear claws from Panera! And low an behold, you suggested it. Making croissants with freezer puff is literally on of my favorite things to do with it! That, and filling them with semisweet chocolate chunks and strawberry preserves, tying them in a bundle and baking them until golden brown filled with a warm gooey chocolate strawberry puddle of love…. OH my goodness!! Will be making these! What was the size you rolled the rectangle? This recipe does intimate me but can’t wait to try! So excited I saw this post! I cannot wait to try them this weekend!…or tonight…I might just try them tonight! You can even cheat even more..use Pillsbury crescent rolls. they are perfect and takes half the time, just brush with the butter, scatter the almonds, shake the powdered sugar and done! Super easy! You can even put a dollop of nutella in the middle for extra yumminess! You can place the butter in the freezer until firm but not frozen, the grate it with a box grater over the puff pastry to get good even coverage. I love croissants, but these are a whole new level! They look delish! I made these and here is my feedback: This is just what I was looking for. I didn’t want to have to spend the time making puff pastry. Mine turned out very pretty. However, I had a hard time getting the almonds to stick to the tops so I just tossed them back on top when they were done baking. Also, adding the almond paste was important to me. Otherwise, they would have been bland. I bought the only almond paste available at my grocery store and it was just ok. At first, I tried these without the powdered sugar, but they weren’t sweet enough so dusted it on and they were very good. Wow! These croissants are beautiful! These look great! The only way they would be better is if they were filled with CHOCOLATE! I can taste it already, fresh & warm from the oven with the melted chocolate in the center. Off to make some puff pastry. It is the flaked almonds and the powdered sugar that starts me drooling.